DESCRIPTION -- Original souvenir lapel pin from the vessel the SS Ocieanic from the Home Line shipping company, which is in a very good condition and dates from the late 1960â€™s. DESCRIPTION â€“ Lapel pin badge from the famous vessel the RMS Mauretania. HISTORY -- RMS Mauretaniawas launched on 28 July 1938 at the Cammell Laird yard in Birkenhead, England, and was completed in May 1939. The second Mauretania was the first ship built for the newly formed Cunard White Star company following the merger in April 1934 of the Cunard and White Star Line. On the withdrawal of the first RMS Mauretaniain 1934, to prevent a rival company using the name and to keep it available for the new liner, arrangements were made for the Red Funnel paddle steamer Queento be renamed Mauretania in the interim. DESCRIPTION -- Pair of lapel pin badges from the SS Nevasa and the SS Uganda which are boxed and date from the 1970â€™s and in a very good condition (click on the picture for a closer look). HISTORY -- The SS Nevasa, also known as HMT Nevasa, was a British troopship built on the River Clyde, Scotland, in 1955 and launched on 30 November 1955. The ship was the first troopship built since the end of the Second World War and the largest troopship at that time to be built in the United Kingdom. The SS Uganda was a British steamship that had a varied and notable career. She was built in 1952 as a passenger liner, and successively served as a cruise ship, hospital ship, troop ship and stores ship. She was laid up in 1985 and scrapped in 1992. DESCRIPTION -- Original souvenir lapel pin from the Donaldson Line vessel the TSS Captain Cook, which is in a good condition and dates from the 1950's. HISTORY -- The company was founded in 1855 as the Donaldson Brothers. They acquired their first ship in 1858, a wooden barque, and it was placed in service between the Clyde, Brazil and the River Plate. About 1880, they added routes from Glasgow to Quebec and Montreal. In 1894, Bristol to Montreal was added but was soon discontinued due to a lack of freight. They became Donaldson Line Limited in 1913. DESCRIPTION -- Original souvenir lapel pin from the vessel the MS Devonia from the British India Steam Navigation Line, which is in a very good condition and dates from the 1950's. HISTORY -- British India Steam Navigation Company ("BI") was formed in 1856 as the Calcutta and Burmah Steam Navigation Company. The company had been formed out of Mackinnon, Mackenzie & Co, a trading partnership of the Scots William Mackinnon and Robert Mackenzie, to carry mail between Calcutta and Rangoon. It became British India SN Co in 1862. DESCRIPTION -- Original souvenir lapel pin from the vessel the RMS Ascania from the Cunard Line, which is in a good condition and dates from the 1930's/1940's. HISTORY -- The RMS Ascaniawas an ocean liner operated by the Cunard Line. She was launched on 20 December 1923 at the Armstrong Whitworth Shipbuilders Ltd yard in Newcastle-upon-Tyne; the fifth of Cunard's six "A" class liners. Due to unforeseen cost overruns, the vessel was not completed until May 1925. HISTORY -- RMS Otrantowas an ocean liner that was built for the Orient Steam Navigation Company in 1925. The "RMS" prefix stands for Royal Mail Ship, as she carried overseas mail under a contract between Orient Line and Royal Mail. Otrantowas in service until 1957, when she was sold for scrap. DESCRIPTION -- Original souvenir lapel pin from the vessel UK passenger vessel the Dominion Monarch, which is in an excellent condition and dates from the 1940â€™s. HISTORY -- Dominion Monarchwas a UK passenger and refrigerated cargo liner. Her name was a reference to the Dominion of New Zealand. The ship was built in England in 1937â€“39, and when new she set a number of records for her size and power. She operated between Britain and New Zealand viaAustralia in civilian service 1938â€“40 and 1948â€“62 and was a troop ship 1940â€“47. She spent half of 1962 in the Port of Seattle as a floating hotel for the Century 21 Exposition and was then scrapped in Japan. DESCRIPTION -- This item is an original Officers badge from the British Petroleum Company London England and is in a great condition. 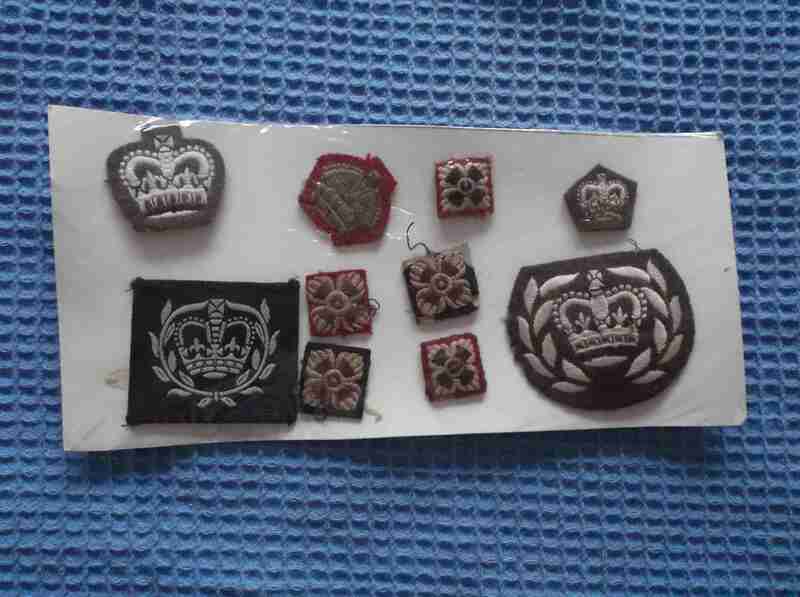 DESCRIPTION -- Fantastic set of Royal Naval uniform badges and are dated between the 1940's - 1950's which are genuine originals and are in an excellent condition. HISTORY -- The Royal Navy is traditionally the oldest part of the British armed forces, founded during the reign of Henry VIII, and so is known as the 'Senior Service'. The official history of the Royal Navy began with the formal establishment of the Royal Navy as the national naval force of the Kingdom of England in 1660, following the Restoration of King Charles II to the throne. However, for more than a thousand years before that there had been English naval forces varying in type and organization.